Working alongside Diana Pardoe for the past few years our school has truly embedded an approach to learning that focuses on providing pupils with metacognitive strategies and getting them to really understand themselves as learners and thinkers. Purple Learning truly is at the heart of learning here at Crowmarsh Gifford CE Primary School. It is about challenge and achievement for all of our pupils. We have adopted a growth mindset ethos where all of our pupils are asked to challenge themselves in their learning. 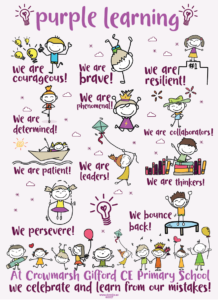 W e talk a great deal about how to know when our learning is challenging and what we need to do, independently, to ensure that we are always seeking to remain within our challenge zones. As part of this, every classroom has a five point plan (or the 4 Bees if you are in our reception classroom) a step by step reminder of what to do when pupils get stuck. We all get stuck and we love making mistakes – if you ask our pupils they will tell you that their best learning comes from their mistakes! The reason behind these plans, is to encourage our children to be independent learners. We know from research, that teaching children the skills of ‘how to learn’ and how to be the most effective learners they can, means that they will always know how to keep themselves challenged and motivated to keep learning. Come and speak to our pupils – they will tell you best about what it really means to be a Purple Learner!